Hans Kammerlander keeps it handy when he is hiking in the mountains, and so are many experienced hikers, mountaineers and mountain guides as well: a stable light-weight trekking umbrella has become indispensible. As a complement to the rain jacket and soft shell, the lightweight, nearly unbreakable and strong umbrellas have secured a place in the outdoor retail branch. Meanwhile, more and more young, quality-conscious people discover the high-quality, hightech umbrellas available at outdoor stores. And they are being bought � also because they have become a cool and trendy accessory item. The leading manufacturer from Germany, who is developing and producing these trekking umbrellas is the Ulmer umbrella maker “Eberhard Göbel”, known under the brand mark EuroSCHIRM. For years, this company has recorded a strong rise in demand for its special hiking and trekking umbrellas - worldwide. This traditional company works together with exclusive sales partners in 20 countries. Especially popular are the modern high-tech umbrellas in Germany and Europe. Here, the light-weight and durable umbrellas from the outdoor shop are considered chic and trendy. They are also used in the city. In the German-speaking market, this umbrella manufacturer is distributing umbrellas through over 420 trading partners - mainly through outdoor and sports retail. This includes industry giants such as Globetrotter and Sportscheck. "For some time now we have been seeing a growing interest, especially among the younger target groups in their 30’s and with families. This trend is also confirmed by our trading partners. The trekking umbrella seems to be on the best way to secure a place in the outdoor market in addition to outdoor jackets and soft shell, "explains Felix Goebel, associate chief of this traditional family-owned business," and obviously the trekking umbrella makes up a development similar to many outdoor products through: It is a lifestyle product, designed for high demands in the field, used in the city. We see great potential for our business, "adds the German umbrella specialist. The success of these special umbrellas made by the Goebel Company is no accident. The modern trekking umbrellas are small high-tech devices from high-quality, extremely robust and virtually unbreakable fiberglass materials: light-weight, extremely sturdy, durable and safe. They are available in different sizes and designs, from mini travel umbrella "Dainty" in your pocket to the modern telescopic walking stick with integrated umbrella. the "BIRDIEPAL outdoor" The official breakthrough of the so-called trekking umbrella came with the model "BIRDIEPAL outdoor", which according to the manufacturer is the most stable trekking umbrella in the world. This ultra-strong trekking umbrella was specifically developed for extreme conditions on mountain tours and expeditions; tested and approved by many mountain guides and climbing schools, among others, Hans Kammerlander. This umbrella has a frame made of shatter-proof fiberglass material. The canopy is made of a special tear-resistant polyamide fabric, the individual segments are connected through double stitching- a characteristic feature of the quality of the trekking umbrellas made by Goebel -. This umbrella, when closed, can withstand loads of more than 75 kg without any damage. Even a sudden overturning of the umbrella canopy, the "death" of any aluminum frame, it does not matter: With a pop, the canopy simply flips back in place, as if nothing had happened. The lightest of its kind: "Swing liteflex"
Another successful product from the Swabian umbrella manufactory is the "Swing liteflex", the lightest among comparable trekking umbrella models in the world. With a weight of only 207 g , an umbrella diameter of 100 cm, and a total length of no less than 64 cm – this model is absolutely sturdy and virtually unbreakable. The ultrathin, highly tear-resistant polyester fabric of the umbrella canopy is also treated with Teflon to repel rain and dirt better. 2010, Goebel brought the first real "handsfree" trekking umbrella on the market, the "Swing Handsfree". This trekking umbrella can be easily connected to any standard backpack with swivel clips hip belt easy to fasten and adjusted according to the wind direction. Both hands remain completely free. The special highlight of this umbrella is its telescopic shaft which is variably extendable in any length and can be tightened with a twist. The handsfree trekking umbrella is available in two versions: "Swing Handsfree" and "Telescope Handsfree". The "Telescope Handsfree" is foldable and with 48 cm in length when closed a little more compact than the "Swing handsfree" which when closed is 76 cm long. 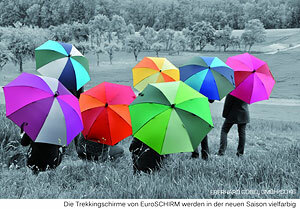 New 2013 - trekking umbrellas are colourful Next season, trekking umbrellas made by Goebel will be multicoloured. At the "OutDoor" show in Friedrichshafen, the company presents seven new colourways, in which four colours are combined. "With our new, stylish colour combinations we want to reach our younger target groups, explains Felix Goebel. - The ultra-lightweight travel umbrella "Dainty" received a reinforced frame, with a significantly higher wind stability. - The telescopic walking stick with integrated umbrella, which was developed together with the walking stick manufacturer Komperdell, has also received an upgrade. The pole will now come with four instead of three telescopic pullout-positions. The umbrella shaft can now also be extended, so you now can also use it like a real umbrella. In addition, the previous aluminum frame has been replaced with a more robust and highly flexible optic-fiberglass material, which will significantly improve the stability of the umbrella even more. The complete trekking umbrella range of EuroSCHIRM can be found at the company's stand during the "OutDoor" Friedrichshafen July 11- 14, 2013 - Hall A7, Booth 101.